Chopin's heritage tours - discover exciting Poland with us! City breaks - weekend in Poland! The payment card authorization system offered by eCard guarantees the highest level of security for our clients. The 2015 was a very special year in Poland. We celebrated the 205 anniversary of Frederic Chopin's birthday. Wide spectrum of events, concerts and exchibitions took a place during the 2015 in Poland. Let us present some our tour offers, which show you not only all the most important places connected to Chopin's homeland, but also actual events, prepared by Polish cultural organizations, Chopin's music fans and travel agencies for this year visitors. Especially, the next edition of the International Frederick Chopin Piano Competition will take a place again in Poland ! Welcome to Poland in 2016 ! Visit the places, meet the history and listen to the music that belongs to Chopin. Our special customised program for Chopin music lovers with piano concert will delight you. Welcome to Chopin's Poland! Your arrival to the Warsaw airport, where you are welcomed by our driver. Transfer to a hotel located in Warsaw centre. Next, afternoon half day tour of Warsaw and its highlights. Later that day time to relax. An overnight stay at a hotel. Breakfast and departure with our guide for a three day Chopin memory tour of Central Poland. Your first visit to Żelazowa Wola – the birthplace of Frederick Chopin. Nowadays you can visit a Museum located in the manor house, surrounded by a garden rich in original plant species. Next, departure to Brochów – a village famous with the parish church of St Roch (now St John the Baptist), where Chopin’s parents wedding was held in 1806, and where Chopin was baptized in 1810. Afternoon, a lunch in a restaurant on the way. Later that afternoon return drive to Warsaw for a Chopin music concert. An overnight stay at a hotel. Breakfast, and half-day guided tour dedicated to Chopin’s relics and mementos in Warsaw. In the tour program: the church of Holly Cross, The National Theater, Royal University of Warsaw, Casimir Palace, Royal Baths park. At the end of that tour a lunch served in one of the famous Warsaw restaurants. Afternoon transfer to the Warsaw airport or train station for your return flight / ride. Tour dates: tour starts on Mondays, Wednesdays and Fridays in April - October 2017. - single bed room – price on request. Your arrival to the Warsaw airport, where you are welcomed by our driver. Transfer to a hotel located in Warsaw centre. Next, afternoon half day tour of Warsaw and places connected with Chopin life and creativity. Later that day time to relax. Optional a Chopin music concert at the evening*. An overnight stay at a hotel. Breakfast. Whole day guided tour dedicated to Chopin’s relics and mementos in Warsaw. In the tour program: the church of Holly Cross, The National Theater, Royal University of Warsaw, Casimir Palace, Royal Baths park. During the tour lunch served in one of the famous Warsaw restaurants. Afternoon time to relax. An overnight stay at a hotel in Warsaw. Breakfast and departure with our guide for a three day Chopin memory tour of Central Poland. Your first visit to Zelazowa Wola – the birthplace of Frederick Chopin. Nowadays you can visit a Museum located in the manor house, surrounded by a garden rich in original plant species. Next, departure to Brochów – a village famous with the parish church of St Roch (now St John the Baptist), where Chopin’s parents wedding was held in 1806, and where Chopin was baptized in 1810. Afternoon, a lunch in a restaurant in Sochaczew, and your visit to Sanniki. Visit to the Frederick Chopin Memorial Centre, located in the old manor house, where young Frederick spent his summer holidays. Later that afternoon departure to Płock for dinner and an overnight stay at a hotel. Breakfast and departure to Szafarnia. On the way short break in Obrowo, where Chopin spent also one of his childhood summer holidays, and had one of his first contact with regional songs, events and dances, which had a large influence for his music creativity. Next, short stopover in Szafarnia, where Chopin spent some time in 1824. 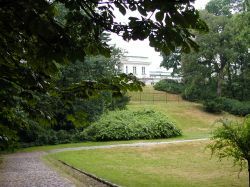 We can visit the mansion - the home to a local Chopin Centre, equipped with concert hall and small museum. 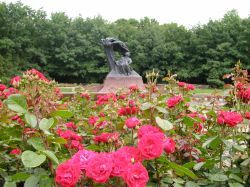 You can walk also across a three-hectare park with six natural monuments dedicated to Chopin’s life. Afternoon departure to Golub – Dobrzyń for a lunch and optional visit to famous Polish castle. 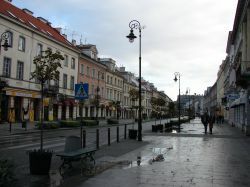 Departure to Toruń – known as a hometown of Nicolas Copernicus. Dinner and an overnight stay at a hotel. Breakfast. Short city walk of the Old Town of Toruń, with visit to the Museum – Copernicu’s home. Departure for return ride to Warsaw, with a break for lunch. Optional visit to Ciechocinek – famous Polish Spa or visit to Niepokalanów (City of the Immaculate) - a Catholic religious community near Warsaw. Later that day your arrival to Warsaw for an accommodation at a hotel. Breakfast and airport transfer or your extended stay in Poland. Tour dates: tour may starts on your request, between 1st of March and 1st of November 2016. - VAT and local taxes. - a single bed room supplement. Welcome to Warsaw interesting and happening city in Europe! Today the city has undergone a huge transformation process. Many old buildings gave way to modern sky scrapers and dilapidating old town was restored. Worth seeing subsection includes sample walks around Warsaw and has suggestions on trips outside of Warsaw. Warsaw is a city with many faces where tradition intermingles with modernity. From the terrace on Zamkowy Square, where the Royal Castle and St. Anne's Church are located, is a view of the new Świętokrzyski Bridge. The dominating silhouette of the city centre belongs to the Palace of Culture and Science, which today shares the city skyline with numerous office towers. You can feel the breath of history in the Old Town, on Nowy Świat Street and everywhere where the city's roots have been preserved. We hope you enjoy your stay in one of the most interesting and happening places in Europe! This site enables you to make the most of your travel to Warsaw. It offers export recommendations for sights to visit, places to stay, car rentals, excursions, restaurants as well as provides useful practical traveller’s information. Hotels, car rentals and excursions can be now reserved online using our fast and reliable service. If you wish to contact us regarding personalized trip to Warsaw or Poland please e-mail us and one of our reservation clerks will get back to you with useful information. Toruń (200,000 inhabitants) is proud of its Old Town, which has been added to UNESCO World Cultural Heritage List. Founded in 1233 by the Teutonic Knights, the city is home to many splendid examples of historical architecture. The Old Town Hall combines the elements of Gothic with late Renaissance. Opposite, there is a monument commemorating Nicolaus Copernicus. In the house of his birth, a collection of documents and instruments from the epoch can be viewed. His name was given to the Toruń University. The sumptuous church of St Mary is famous for its stellar vault. The famous astronomer Nicolaus Copernicus was born and lived in the medieval town of Toruń, which is now on the UNESCO World’s Cultural Heritage List. Copernicus was the first astronomer who said that the earth is not the centre of the universe, but rather the planets revolve around the Sun. Maybe this is what makes our sky so attractive for aviators. Polish air clubs have training courses for aircraft and glider pilots. Hang-gliding and increasingly popular motor-gliding can also be enjoyed in Poland. Enthusiasts of hot-air ballooning and parachuting are also catered for.